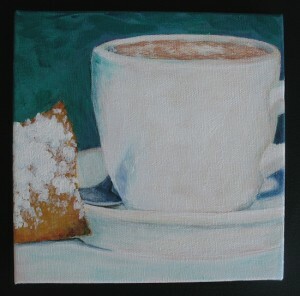 Cafe Au Lait & Beignets, anyone? I don’t think it’s quite finished yet but I don’t really know what else to do to it so I’m posting it for Paint Party Friday and taking suggestions if anyone has any. The Thalo green is not a color I normally use much, which is why I chose it, but that might be what feels off to me. And I’m not sure the powdered sugar looks like powdered sugar. DS says it is impossible to paint powdered sugar that looks like powdered sugar and the rest looks fine, but I don’t know if he knows what he’s talking about. This is acrylic on a 6″x6″ gallery wrapped canvas. This entry was posted in Arts & Crafts on October 13, 2011 by admin. Well it looks pretty good to me and I’m hungry, so I’ll take it! :) Nice job. Well I like your powdered sugar, it makes me crave beignets like I had when I was in college in Louisiana! Happy PPF! well, i think your powdered sugar absolutely looks like powdered sugar! this is gorgeous and i actually really like the background colour. agreed – powdered sugar looks fantastic, and the thalo green background is great. very impressed by your shading and the reflection of the spoon in the cup. To me it looks exactly like powdered sugar. I don’t know how you achieved it but I think it is just right. The painting is very yummy. The phthlo blue is gorgeous. Sorry about the spelling but I’m not able to load another PPF to see how it’s spelled. maybe some sort of reflection in the front of the cup? I’m a big tea drinker and the cup looks great! Very 3D. Your art made me wish I was back in New Orleans for those beignets. I think the powdered sugar looks tasty! I like your painting – don’t change anything. I also realize that’s easier said than done when one is talking to the artist. What I wouldn’t give for another cup and beignet at Cafe du Monde! I think you got the powdered sugar perfect! And what a yummy looking painting! What a charming little painting this week…Great job! Happy PPF! I think it is finished just perfect. Made me hungry. I love it, think it looks very real! I think everything looks great, so maybe it’s just the green that is throwing you off? I would print it out and try a different color background in your printed version. love, love, love! it’s beautiful. I wanted to eat the cake when I first saw the image. I love the cool blue shadows on the plate and cup. well done. Thanks for the link, it is very informative! I think it is great!! Tholo Green is a color I use alot. So I am partial to that color. I love it!! I really want a cup of coffee & a little sweet right now! Looks wonderful! Sweet! Delicious and PERFECT! I’m loving the way it looks for sure!